Had a great turn-out last Saturday, folks divided up into several teams and quickly got down to business. Tom Gaylord started the day out easy by painting the bottom border on the wooden entrance sign. Carl Canga had repaired the decorative trim along the bottom on a previous trip. Al Sumrall has said he'll get some green paint and touch up the metal rail fence at the entrance before the Air Fair. The wood on the sign isn't faring well... I suggested to Roger he laser cut some metal stuff for the sign to create something more durable! Tom then joined "Team Washing". Bill & Will Walsh, Tom Gaylord, Susan Braden, and a whole host of others throughout the day washed various aircraft. The worst of the bunch was the Meyers OTW!! The 2nd aircraft we tackled! Only the 2 Fokker D.VIIs and the Rearwin Sportster need washing. The Piper Cub, Meyers, Bleriot, and Pietenpol were all washed. Jeez... seemed like we washed more airplanes than that!!! Greg Solberg wasn't able to attend, but sent along the Ford Model T steering wheel he made. Still needs a few coats of varnish to complete, but Al took the part home to finish that. The rim is all mahogany wood and is gorgeous. During the day Mike McMains flew down in his RV-7 (christened "Mighty Mouse") to deliver the fuel/oil tank for the Curtiss Junior. Needs a few tweaks to fit perfectly, but looks "the business" perched in front of the engine. Mike also brought along what he has done on the Indian motorcycle fuel tanks. Mike says that the tanks were just corroded and useless except as patterns. Mike had about 75% of the right side tank to test fit to the bike. Sanford turned into a one-man "Team"... Team Sewing Machine! Roger and crew are starting the covering process on the SPAD and Roger's ancient (1918?) "professional" sewing machine was in need of some TLC. Sanford tackled the job and appears to have conquered the thing! Sanford's wife is a world-class quilter, so apparently Sanford has become a sewing machine technician over the years, in addition to his other fine qualities! Terry Bledsoe spent nearly all day in the new hanger, sorting boxes of parts, condensing the boxes, etc., etc. The first item addressed was moving the wood Roger brought back from his father's place in California into the shop proper. Team Lumber (Mike McCormick, Isaac Bridges, Doug Hortvet, and Gary Goolsby) lept into action, sorting the wood and getting it all stored! Roger has some amazing chunks of wood... 30 ft lengths of aircraft spar grade Sitka Spruce!! Unwieldy things to store! I didn't see the hanger after Terry was done, but for the amount of effort he put into the task I'm sure he made a major impact! 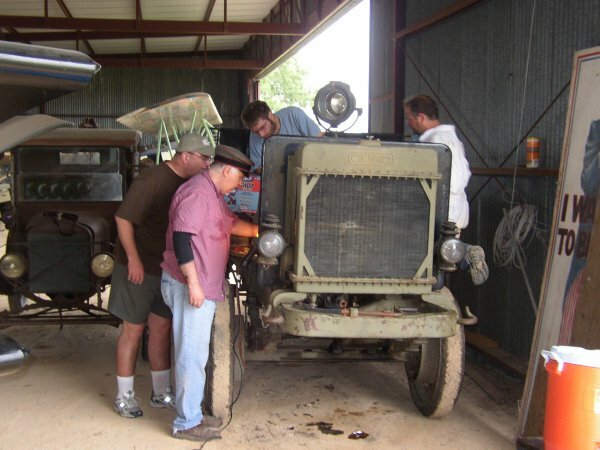 Team Canuck (Tom Miller, Gary Goolsby, Doug Hortvet and others) went back to work fitting the improved engine priming system and completed the task that day. Very late in the day the aircraft was buttoned up and Roger took it for a test flight. All went well, but the engine seemed to be running quite rich. Still a few engine bugs to work out! Ron Marcotte re-installed the cockpit coaming fairings on the Fokker Triplane. Roger hasn't gotten them covered yet, but he is eager to resume flying the airplane since the most recent rounds of mods has been completed. Ron then assisted Team Washing, especially with moving aircraft into position! Team Vehicles (Al Sumrall, John Bush, Dave Miller & Jeremy Beheler and others) went to work mainly on the Nash Quad. The water pump is giving them fits. Attempts were made to get air into the ambulance tire, again, I think, without success. Once again, the running vehicles were driven around the grounds to keep their vital juices flowing and going. That pretty much sums up the day. A lot got done folks, Congratulations! And Thanks!